The Sacred Artifact (book 2 of the Young Alchemist series) is a middle grade fantasy novel that tweens and young teens who are fans of fantasy and adventure will devour. The story picks up where the first book left off. 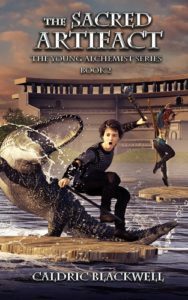 Craig Pike, the student alchemist, goes on an adventure with his teacher, Cornelius, and his friend, an archer named Audrey. Just like the first book, the plot is very fast-paced and doesn't waste time in getting things going. The protagonists are soon on a dangerous quest to uncover the secrets of a sacred artifact (the namesake of the book). As one would expect, their journey isn’t easy. Within a day of setting out, things start getting tricky. Craig, Audrey, and Cornelius find themselves in a swamp region where they enter a competition reminiscent of the Triwizard Tournament in Harry Potter. Eventually, they make it Tarvel, a mysterious place where alchemy was started, hoping they can find out more about the mysteries of the sacred artifact. The book is divided into two parts, with the first part being the journey to Tarvel and the second part, without giving too much away, being a quest to keep a powerful object out of the hands of the story's antagonist. One of the greatest strengths of the book is the cast of characters. Readers get more of Craig and Audrey, who are familiar to fans of the first book, but also get some interesting new characters. Blackwell does a good job of making the characters feel real and their interactions interesting. Another strength of the book is the sense of adventure. The characters are travelling to exotic places, from swamps to barren tundra, with action around every turn and plenty of alchemy. There is certainly no shortage of action. In terms of weaknesses, if you don’t like fast-paced books, you won’t like this book. There isn’t much “down time," so to speak. The plot is always moving forward, but that could just be a function of its aim at a younger audience (middle school and elementary school students are most likely to enjoy the book). Buy the Kindle version of "The Sacred Artifact"